“This is like North Korea”. Amid general outcry, someone called out, to a round of applause. 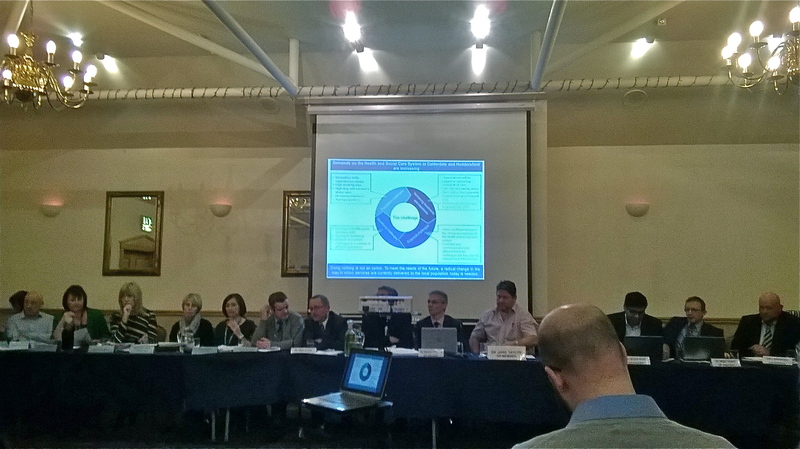 “I’d like to clarify that this is a very different new model of urgent and emergency care than is currently in place. Dr Brook, the Chair, refused a plea from the floor (by me), to explain how an ECC functions differently from our current blue light A&E. Except when you read the pre consultation business case, you find that Kirklees patients will be sent to the nearest A&E, not necessarily to Halifax. Which was a bit of a shock. 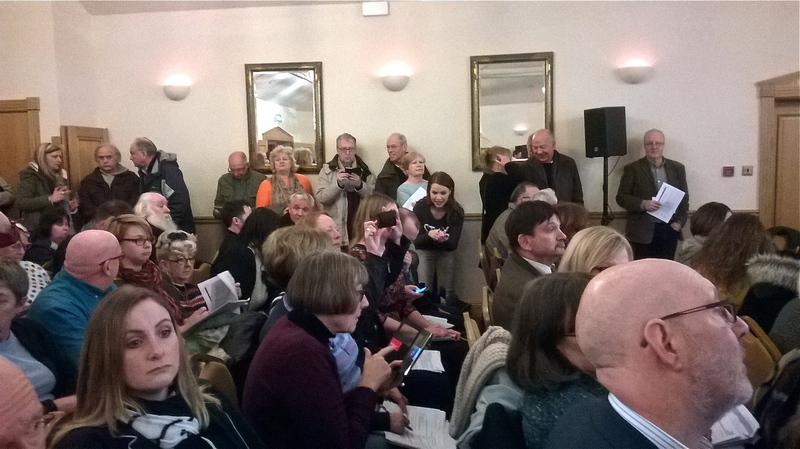 It was standing room only at the NHS commissioners’ meeting to rubber stamp the decision that they were ready to consult the public on their plans to cut hospital services and replace them by care in the community; scores more people were unable to get into the 100-ish seater room at Briar Court Hotel. Waiting for the meeting to start, a bald member of Calderdale CCG governing body repeatedly mopped his pate with a large handkerchief. Dr Alan Brook, true to form in previous CCG meetings, swiftly infuriated the public by telling us this was not a public meeting but a meeting in public. At which there was a general outcry. Incredulous protests were met by Dr Alan Brook calling the meeting to order. M Mulcahy proceeded to explain that Phase 1 of Care Closer to Home had been done, and in Kirklees the CCG had awarded the contract for this to Locala. Undeterred, Ms Mulcahy ploughed on through her presentation about how the CCGs were ready to consult the public about their proposals for hospital cuts. Dr Brook tried to get a word in edgeways. I stood up and asked for an explanation of how an ECC would function differently from A&E. Applause from most of the people in the room showed they wanted an answer to this question too. But the chair Dr Brook refused. (So after the meeting I ploughed through the Pre Consultation Business Case (PCBC) trying to find out how the Emergency Care Centre differs from an A&E. I also sent out an appeal for info from anyone in the know. This led to an A&E Consultant kindly taking the time to provide an explanation – see update at the end of this report. Which was met with loud applause. And after a few more rehearsed, spineless comments and questions from Governing Body members, both Governing Bodies unanimously agreed to consult the public on the so-called Right Care Right Time Right Place NHS cuts scheme. As already reported, this did not go down at all well with the public. A Kirklees Councillor stood up and protested at the Governing Bodies’ refusal to take public questions and to use the 10 Minutes on the agenda allotted for answering public questions. 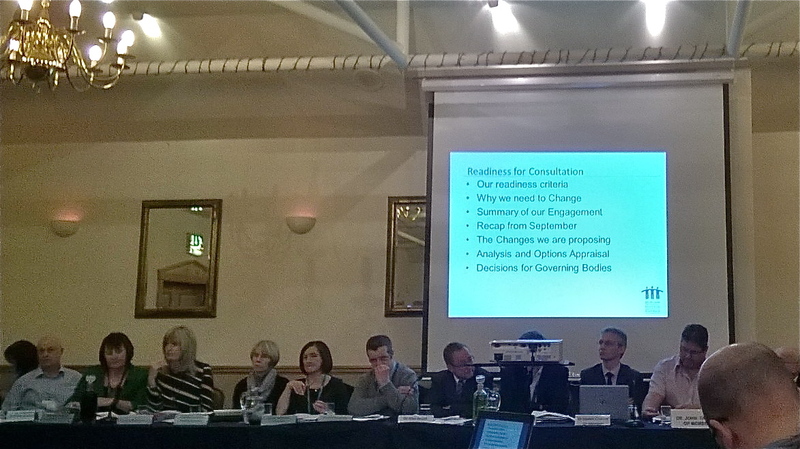 Dr Brook said the next steps would be to produce the detailed consultation proposal and the consultation plan and to launch the consultation in early February, to run for 12 weeks followed by 7 weeks’ reflection by the CCGs. And then the Governing Bodies were off to lunch, leaving members of the public to exchange emails addresses, phone numbers, cards, information and protest arrangements. There is a demonstration at 1pm in St George’s Square on Saturday 23rd January and a public meeting on Wednesday 27th Jan, 7pm at The Methodist Mission, Lord St, Huddersfield. Save Lewisham Hospital has emailed to offer their support in our campaign to keep both A&Es open and to stop the hospital cuts. The evil empire run by Simon Stevens, previously Vice President of global American health insurance company United Health, is setting about Calderdale, Kirklees and North Kirklees. The proposed “Right Care Right Time Right Place” hospital cuts will irreparably damage the NHS in all 3 areas if we let them happen. 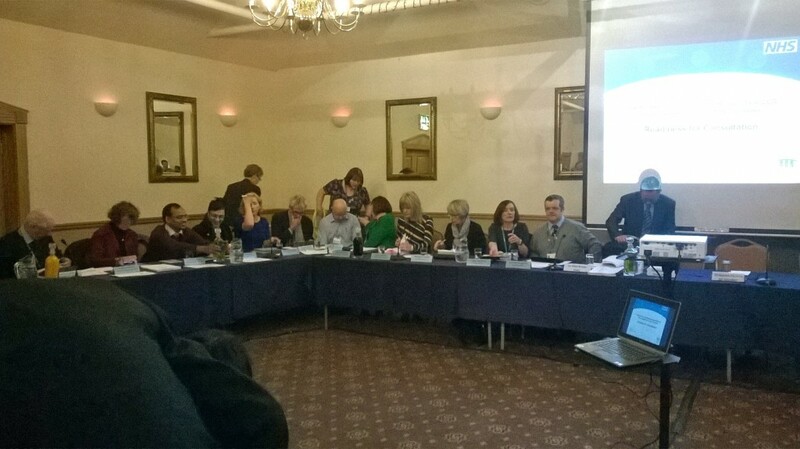 There is a joint scrutiny committee meeting in Huddersfield on 29th Jan. 10.30am, Council chamber, town hall. The committee have the power to stop the consultation on the grounds that the proposals will damage the NHS in both Calderdale & Kirklees, and since both Councils have rejected these Right Care plans as unfit for the people in their areas, the committee won’t have a leg to stand on if they don’t stop the consultation and refer the plans to the Sec of State for Health. Everyone who can, needs to go to that meeting and email councillors beforehand too. 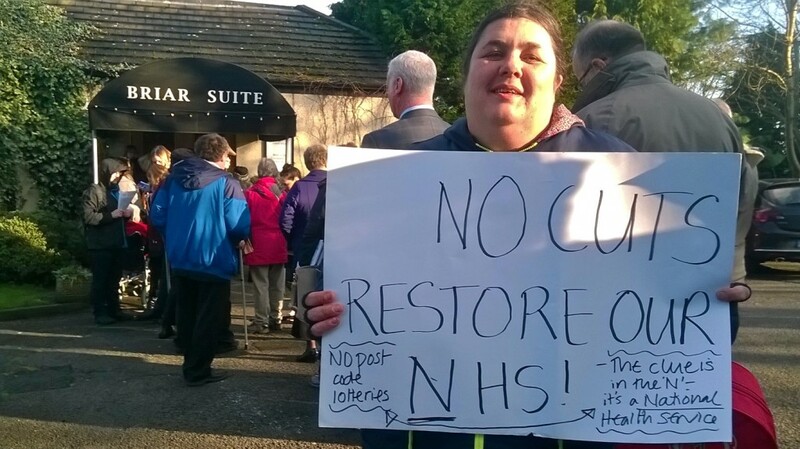 Last night Kirklees Council also rejected the “Right Care” plans. “I’m unfamiliar with the term “Emergency Care Centre” as are those of my colleagues I have asked about it, in addition the Royal College of Emergency Medicine make no reference to it as a recognised entity. What I have found so far are centres bearing this name in Wigan, Gateshead and Cambridgeshire. So as long as that is the same as an Emergency department, then I guess that would meet the approval of the Royal College of Emergency Medicine. But the PCBC doesn’t seem to specify the opening hours of Emergency Care Centre. It says there would be a 24 hour operating theatre, and it says the urgent care centres would be 24/7, but can’t anything about ECC opening hours. There are still questions that need answers from the CCGs. 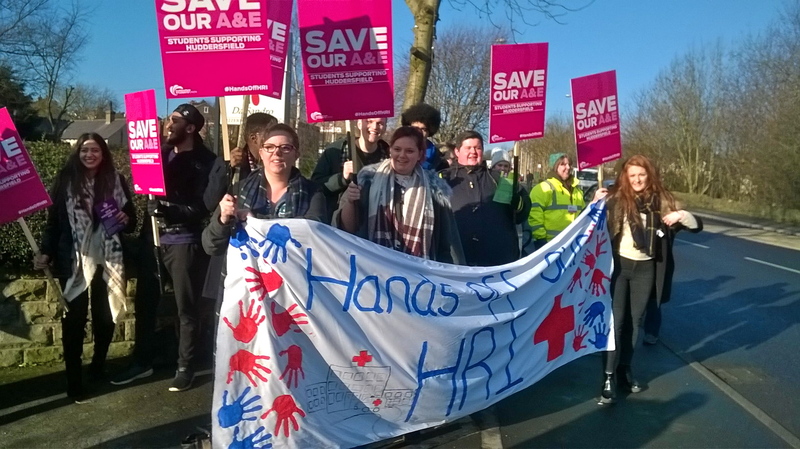 This entry was posted in Social fairness and tagged #HandsoffHRI, Calderdale CCG, Calderdale Royal Hospital, Consultation, Emergency Care Centre, Greater Huddersfield CCG, Huddersfield Royal Hospital, Right Care Right Time Right Place engagement evidence pack by jenny. Bookmark the permalink. High Wycombe lost its A&E and gained an ‘ emergency medical centre’ which could take heart attacks, strokes but NOT accidents or anything requiring surgery (this was part of a shake up in which all surgery moved to the sister hospital Stoke Mandeville, some miles away). The EMC didn’t work out and now we have a ‘ Minor injuries and illness unit’ instead. Moral: words mean what the bosses want them to mean. Every CCG area can expectvthe same, or similar treatment. This is part of a National scheme to destroy the NHS. Wake up people before its too late. You are experiencing exactly what we had in Newark. What followed was a flawed consultation and the loss of our A&E. We were promised a Minor Injuries Unit and Urgent Care Centre – despite the wishes of the people to enhance the A&E – what we have is only a Minor Injuries Unit and now patients even those with the less serious injuries and illnesses are forced to travel 23 miles to other hospitals. That’s a nice piece of work. I speak as an ex-journalist. Thanks for this. I was at the meeting. This is a very accurate summary. Let’s pull together and stand up to this nonsense. Let’s fill St George’s Sq on Saturday for a start. Very revealing report. Good work!! The Rally on Saturday starts at 1.00 and the meeting on 27th is in the Methodist Mission on Lord Street starting at 7.00. Thanks for the summary from someone left out in the cold for the whole procedure !! 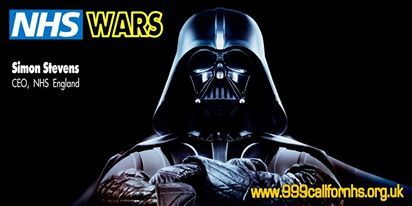 Tx for info, everyone needs to know about this madness! Please share as widely as possible!